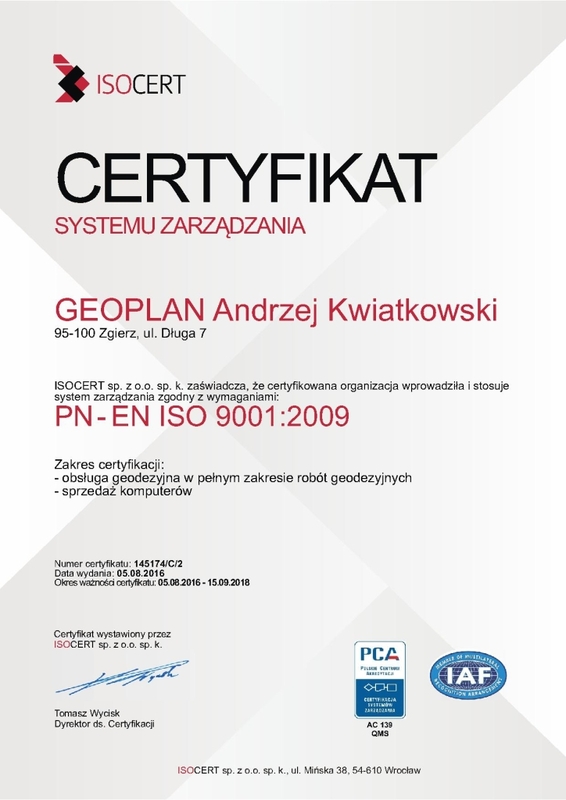 GEOPLAN was founded in 1998 and today it is one of the leading surveying companies in Poland. We offer wide variety of sevices which are always performed on highest world class level. GEOPLAN mainly cooperates with large construction companies and public institutions which constitutes 99 percent of the total income. In 2007 we received ISO 9001:2000 certificate, which was later updated to requirements of PN-EN ISO 9001:2009 Standard. Following the ISO Standard guidelines GEOPLAN constantly increases its effectiveness which contributes to a significant improvement of the efficiency and quality of services. Long term strategy of the company development assumes constant broadening and perfecting offered services. In order to fulfill this idea GEOPLAN has been successfully investing in research and development and improves equipment facilities. Our biggest objective is to transcend the expectations of our clients and gain their full trust. Professionalism, observing quality standards, hard work but most of all passion to our area of expertise makes us a reliable solid partner. Our staff is highly motivated, determined, constantly developing and strictly focused on the needs and expectations of our clients.